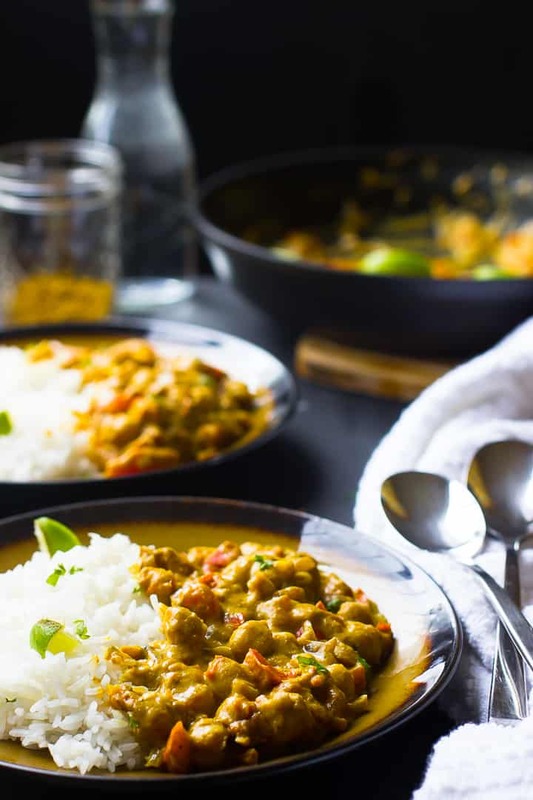 This Creamy Vegan Coconut Chickpea Curry is the BEST curry I’ve ever had! All it takes is one pot, it’s loaded with homemade ground spices and incredibly flavorful! The best kind of recipes are the ones that you keep making over and over, without realising that it’s one of our favorite recipes. The ones that are made up of ingredients you probably already have in your pantry, don’t take much effort, but produce incredible results. That my friends, is this Vegan Coconut Chickpea Curry. I’ve kept this beautiful dish in my pocket for a while now but decided it’s time to bring it’s beauty to light. I learnt something a long time ago: sometimes the brownest food, is the best food. Brown tends to mean spices, infusing of flavours, and delicious starches and produce mixed together. What can I say – I love me some brown food. 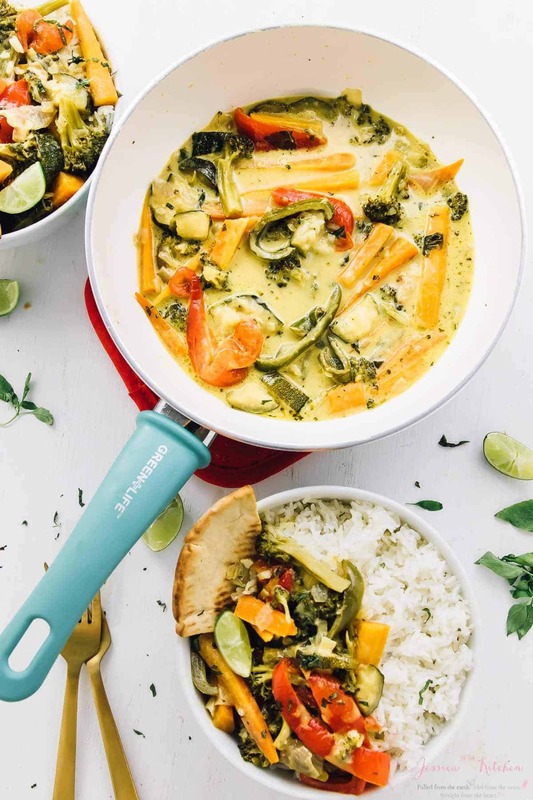 That’s why I also love my Thai Green Curry recipe – can you say flavour heaven! Not to mention my Red Lentil Curry – truly what dreams are made of. Then there’s my most recent Cauliflower and Potato Curry (Aloo Gobi Masala) – Crispy potatoes, loads up comfort. 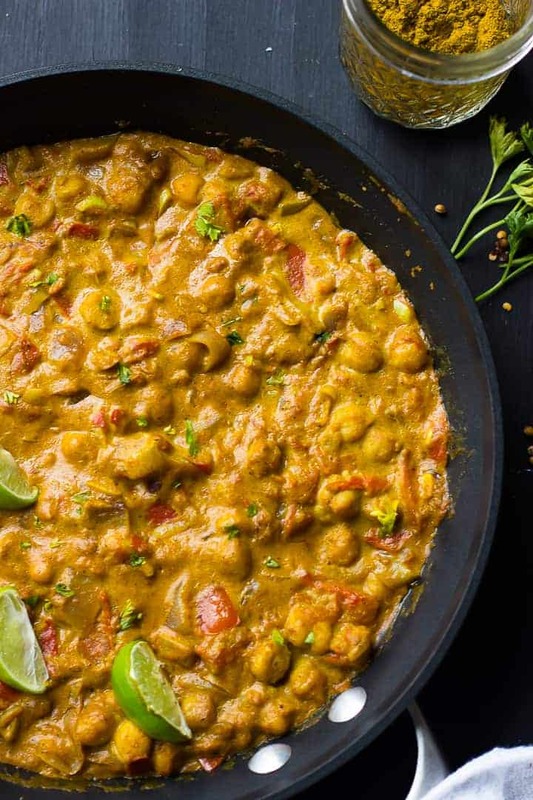 This Vegan Coconut Chickpea Curry is no different. I didn’t realise I enjoyed curry until I became vegetarian; in fact, it’s safe to say that that’s when I fell completely head over heels in love with indian spices. 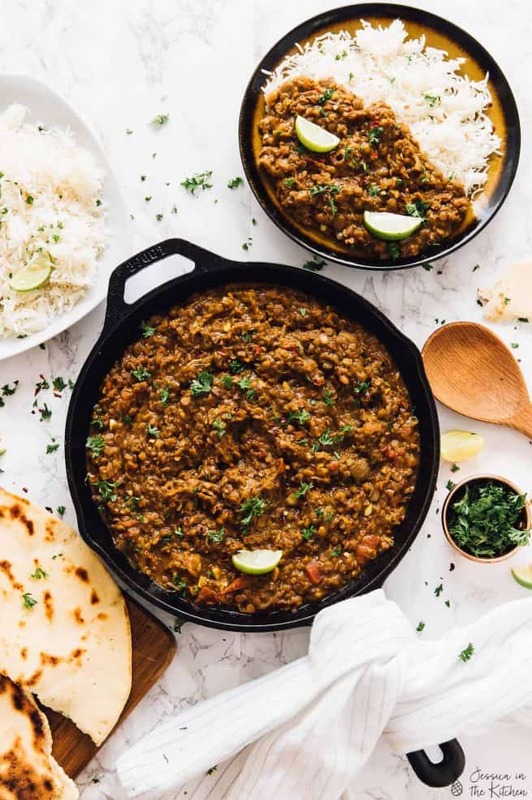 This curry came together with ingredients I already had in my pantry and was so absolutely easy to make. One pot, stewing together of flavours and spices and the most effort you have to make is to cut up the ingredients. P.S. doesn’t this fall under perfect fall vegan recipes for comfort?! I wanted to use 100% completely fresh ingredients for this dish, so instead of canned diced tomatoes, I used freshly diced tomatoes the second time I made this. I asked my husband if he tasted a difference (without knowing the differences yet) and he said “the second dish definitely has even deeper flavours”. Fresh ingredients all the way! For the first time ever, I also ground my own spice mixture! What took me so long?! The garam masala that you buy, and the garam masala that you make is SO different. Fresher, brighter, deeper. Point blank: We finished the entire pot in about 2 hours. It was so good that I’m going to combine my own spice mixes from now on. It’s as easy as getting the seasonings fresh from your local Indian supermarket or speciality store, and combining the different seeds for (for example) garam masala instead of buying it. It took me less than 5 minutes. If you don’t have a spice grinder, a high powered blender like a NutriBullet blended these up in seconds for me. Also, this Scotch Bonnet Pepper Hot Sauce tastes bomb in this curry. You have to try this dish. It’s creamy, delicious, and will leave you wanting even more after you’re completely full. It’s also incredibly nutritious, protein packed, and leftovers lasts for days. P.S. do not forget to squeeze a lime over the top. It tastes EVEN better! It’s also perfect for meal prep! Whether it’s for meal prep lunch or dinner, this actually freezes well and lasts for a long time fresh in the freezer. Q: Can I substitute the tomatoes in this curry? A: No and yes (update). I promise, if you’re not a tomato fan, you won’t taste them. They blend right in and help with the thickness of the curry and all that flavour. If you’re allergic, you can in fact substitute them with pumpkin puree, or a butternut squash puree or something of the sort. It won’t taste exactly the same, but will give it that beautiful creamy texture! Q: Can I make this chickpea curry with spinach? A: Yes! Actually, readers who make this chickpea curry have used everything from spinach to broccoli, cauliflower and several other veggies. Feel free to add your heart’s content – it only makes the curry better! Q: What goes well with this chickpea curry? A: Any of the above veggies. You can serve this curry with basmati rice and/or naan bread. Q: Is the lime necessary? A: YES! Several readers have told me that this recipe came alive when they did the lime squeeze. Please don’t skip it!! It’s so crucial to bringing out all those delicious flavours! 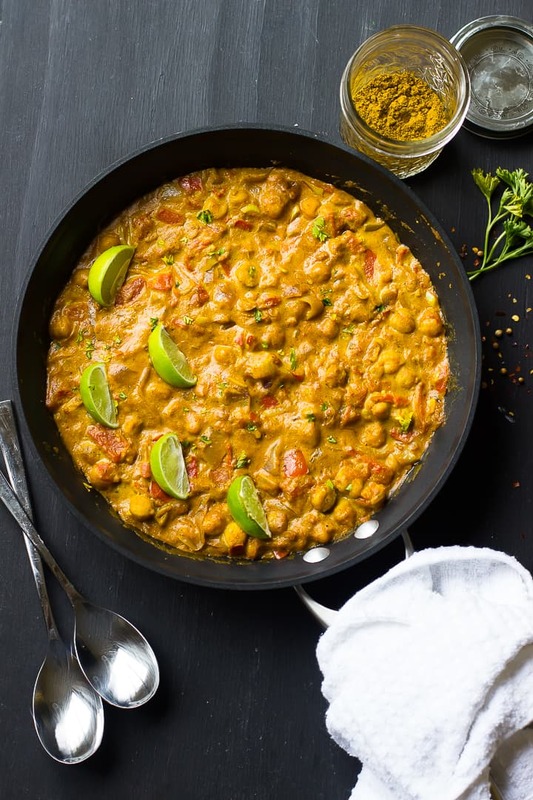 This Creamy Vegan Coconut Chickpea Curry is the BEST curry I've ever had! All it takes is one pot, it's loaded with homemade ground spices and incredibly flavorful! *Many readers have asked and yes you can definitely used reduced fat coconut milk! You can even used boxed coconut milk if those calories suit you better. ** The coconut flour is optional and up to you! You can also use any other gluten free flour you have on hand to thicken it, I just loved this flavour the most. You also don’t need to thicken it if you don’t want to, we skip it all the time. HOW TO STORE:You can store this curry in an air-tight tupperware container in the fridge for up a week. It’s an excellent candidate for freezing and can be stored in the freezer for up to a month. 3. I substituted a can of chickpeas in the recipe for ease, but if you want you can buy dried chickpeas, soaked overnight, and then boiled until soft in replacement. 4.If you don’t have coconut flour, you can use regular flour if you’re not gluten free. If you try this Vegan Coconut Chickpea Curry please let me know in the comment section below, or tag me on instagram with the hashtag #jessicainthekitchen! For more exclusive recipes follow me on Instagram AND on Snapchat: jessinkitchen. That is one delicious looking curry – so creamy too. We love chickpea curries. This definitely looks like a dish that I would make over and over again, too! I love the coconut and chickpea combo, Jessica! Sounds like the perfect comfort meal! No problem, Jess. 🙂 Lovely site! This is something I would totally love too! I love making curry! & ones with chickpeas and coconut are the best 🙂 I’m pretty certain this will be on my dinner table within the next few weeks! yummy! so glad you fell in love with Indian spices and flavors 😉 I will be biased and say they are the best haha.. love this curry..so flavorful! I used to think I didn’t like curry spice and was I ever wrong…I guess I just had a bad experience once? I love it now, and I’m glad you let this dish out of your pocket! It looks so hearty and satisfying, and I love that it’s made with pantry staples! Mmmm I’ve been all about the curries lately and cannot get enough! Especially when there is coconut milk involved! This looks and sounds delicious!! I have absolutely everything for this curry! It’s an easy weeknight meal too. I might add some chicken in it but that’s ok! Thanks for sharing your favourite with us! You’re welcome Z! Totally add anything you desire :). Thanks!! Do I drain the tomatoes? Can’t wait to try this! Oh, and how many fresh tomatoes? ? I actually used fresh tomatoes! Literally just weigh out your tomatoes on the scale until they reach 14 ounces, then chop. Enjoy!! If you’re using canned tomatoes then yes, drain them! Looks absolutely delicious ! Coconut and chickpea combo is indeed yum! This looks SO cozy & delicious! It’s been so cold here so soup stews and curries are all we’ve been craving! I love that you used all fresh ingredients! I can just imagine how flavorful this is! Just made this and it was great! Will go in recipe repertoire! Made own garam Marsala spice! Super easy! So glad that you enjoyed this! Isn’t homemade garam masala amazing?! Thanks for the feedback! I just made this! It was perfect. I can’t wait to add some greens in next time! Thanks Vicky! <3 so glad you enjoyed it. Love your idea of adding greens! My husband and I both hate tomatoes, sadly – mostly because of the texture. Could you blend the tomatoes rather than dicing them? Or use crushed tomatoes or something? Thanks! You can definitely use canned crushed tomatoes that weight the same amount. You don’t taste the tomatoes at all in the recipe especially if you do it that way! Hope that helps! I made it today and it is delicious! The only mistake was I didn’t make enough 🙂 This is definitely a go-to recipe. I can’t wait to be invited to the next potluck. So glad you enjoyed Kristine!! Thanks so much for your feedback! Just made this, absolutely delicious! Thank you for a great recipe that is wholesome-both in taste and with the fresh ingredients! I will definitely be making this again! I’m so glad that you enjoyed!! Thanks so much for the feedback and you’re SO welcome! AMAZING!!!! Thank you for this delicious curry recipe ? Will definitely be making this again! I’m SO glad that you enjoyed! Thank you so much for you feedback and you’re so welcome! Just made this and it’s awesome! 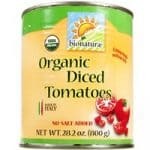 I used half a 28fl oz can of diced tomatoes instead of fresh tomatoes, still great! Next time I’ll try fresh. I had to go buy garam masala and I’m so glad I did! Cooked up some brown rice to enjoy it with. Thanks! I’ll be making this more often! Thanks so much for your feedback! I’m so glad you enjoyed it and you’re so welcome! You’ll definitely also enjoy it with fresh tomatoes too. Have you tried making it in a slow cooker instead of on the stove? No I haven’t but it should be possible on low. If you try it please let me know! This is really an outstanding recipe. Rich, deep flavor, and yet so easy to make. Thank you. I’m so glad you enjoyed it Betsy! Thanks so much for letting me know! Hey looks great 🙂 how many people does this serve? I know I replied to you already via email. I would say this could serve up to 5 people with normal servings with rice or naan bread, or 3-4 slightly larger servings. Hope that helps! You’re so welcome!! I’m so glad you enjoyed and thanks for your feedback! This is one of my go-to dishes for family dinner. So quick, minimal prep. So, so good. It freezes great and even might taste better after freezing. Thanks so much for letting me know Tamara and for your feedback! So glad that you enjoyed my recipe! Loved this. Didn’t have garam masala, but added chili powder and some turmeric instead–SO good. Sautéed spinach/kale is a nice touch in it as well. I’m SO glad you loved this Camille! I’ll need to add some greens to this next time! Thanks so much for your feedback. Amazing recipe, my husband and I both loved it! The onions seemed to be a little much though- probably could have been fine w one large, at least for us. I also added some red chile pepper flakes for some extra kick. I will definitely be making this again, thank you! I’m so glad you enjoyed my recipe!! Thanks so much for sharing your feedback!! Is 1/1/2 tablespoons of Garam Masala correct ? it just seems a lot however it sounds delicious I cant wait to make it. Yes that’s correct! It is a lot but definitely the amount needed for this curry. I hope you enjoy so much! This recipe is awesome! I added spinach to the mix and used 1/2 can tinned tomatoes cos thats all I had. I’m SO glad you enjoyed! Loving the greens you added. Thanks so much for your feedback! Thanks for this recipe Jessica. I topped it off with some leftover green beans to give it some extra color and flavor. I will certainly be make this in the future! Easy as pie. I’m so glad you enjoyed!! You’re so welcome. Love the leftover green beans idea. Thanks so much for your feedback! Just wondering if you happen to have the nutritional info available for this dish? Thanks so much! I just added this above! It’s 224 calories per serving which is enough for a dinner. Hope that helps! What a delicious looking curry. Excited to give this a try soon! I made it last night and added a few veggies I had in my fridge (eggplant, green pepper and beet). It was delicious and so easy to make. Can’t wait to make it again ! I’m SO glad that you enjoyed!! LOVE the additions of you put in there. Thanks so much for your feedback! This was great. I did add diced mushrooms in with the onions to give it a “meaty” element. And while it simmered I added broccoli for veggies. I will definitely make this again!!! I’m so glad you enjoyed them!! Love your additions. Thanks so much for sharing! Wow, wow, wow! I think this is the first time I’ve commented on a recipe. Made this last night and my husband and I loved it!! This is definitely a keeper! Thank you so much! Yay! Thanks so much for letting me know! You’re so welcome 🙂 🙂 . I loved this dish! What a delicious, simple and basic curry. I made it according to the recipe and loved it. But, what is great is that there are endless variations that can be made from this base, just by adding vegetables (red pepper, broccoli, eggplant, cauliflower come to mind) and even chicken (if not vegetarian). Thank you so much!! Thanks so much for letting me know! Love all the additions you put in! SO true, it’s a great base and this curry sauce can be used in many other things. So glad you enjoyed! I made this today! I added mushrooms, red, green, and yellow pepper along with the chickpeas, tomatoes and onions. It smelled SO good, and then I tasted it and thought “hmmm seems bland”. As I was clearing the counters I discovered why – I forgot to squeeze the lime in there! WOW, that made ALL the difference in the world and all of a sudden the flavours were all there! DELICIOUS! Oh, and I added more curry powder :p just because, well, I love curry powder! SO glad to hear!! Haha yes, the lime is SO important! I’ve had so many friends make this and tell me that makes so much of a difference! Thanks so much of your feedback. 🙂 love all the additions you put in! How many times did you need to mention that it was vegan? 9 times! 20 times in total on the page. Would it be possible to puree the tomatoes? It’s not so much a taste thing as it is a texture thing for me. I would just rather not buy the ingredients if you don’t think it’s a good idea. Any advice you have would be appreciated, as this looks divine & very student budget friendly! Hmm, I wouldn’t recommend puree-ing the tomatoes. My husband has made this several times with half the amount of tomatoes though and it still tastes great. So you could use less and they do burst and simmer down which reduces the texture a whole lot. I hope that helps!!! Thank you for your kind comments by the way! Ok thank you so much for the advice, I will try halving the tomatoes! I made this last night for me and my husband, and boy was it a hit! I roasted up some eggplant in the oven to toss in as well (in addition to the chick peas). Absolutely delicious! I’m so glad to hear!! LOVE the eggplant addition. Thanks so much for your feedback! I don’t have limes would lemon work instead? I haven’t tried lemons, and limes really do add that acidic touch that brings out all flavours, but they should work since they are almost as acidic. Let me know how it works out for you! Thanks! It is so true what ypu said about the lime!!! I tasted it before the lime and thought it was a bit bland… A few squirts of lime juice and it was like WWWWOOOOOWWWWWW!!!!! Haha it makes quite a difference! Thanks for your feedback! Jessica, this recipe was awesome. I added some ground turkey and served it with a tomato/cucumber salad. My wife and I devoured it served, over jasmine rice. Thanks so much. I wish I knew how to post a picture for you. Hi Dave, thanks for letting me know!! You can reply to this email with the picture – I would to love to see! Or, on my Facebook page you can leave a comment on this video with the picture uploaded: https://www.facebook.com/jessicainthekitchenblog/videos/1311931028825942/ I love your additions! You’re so welcome and thank you again for your feedback! Thanks for the recipe! I made it this evening and added broccoli because I have too much of it in the fridge and it was stellar! I tasted it before and after the lime, distinct flavors but I looove the lime addition! You’re so welcome! So glad you enjoyed! Love that broccoli works in this recipe too. Yes, the lime makes such a HUGE difference. Thanks so much for your feedback! Wow! I just made this recipe in my Instant Pot (cooked the onions, garlic and then spices, then added everything else in the pot). It was one of the best meals that I have eaten. Thank you for this recipe! We got an instant pot for Christmas and I would love to know the time you cooked this for!!! Hey Samantha, I started off with dried chickpeas. Cooked them for 40mins. Then while making the recipe, cooked the whole dish for 15 mins high pressure. I also added 1 cup of water (in addition to the coconut milk) and skipped the flour (since it’s not recommended in the IP). Hi Melanie! How did you you do this in the pressure cooker? Hey Alison, I started off with dried chickpeas and cooked it for 40 mins in the pressure cooker (you can skip this step if you use canned chickpeas). I sauteed the onions and garlic in the oil, added the spices and stirred until aromatic. Then added the rest of the ingredients (with 1 cup extra water) and cooked for 15 mins high pressure. I didn’t add the coconut flour since it’s not recommended in the instant pot. and Voila! Was delicious! I made this for my family recently and everyone LOVED it. They put it on the “Let’s have this again” list! Great recipe! I’m so glad to hear!! I thought I had replied to your comment. Thanks so much for your feedback!! Jessica, is the garnish in your photos cilantro? Parsley! You could use cilantro if you want though! I made this last night and it was a hit! I added some red peppers and carrots to it and garnished with cilantro! Would you mind if I shared this recipe on my blog and linked it to your page? So glad you enjoyed and thanks so much for your feedback! I don’t allow full reproduction of my recipes, so if you share you’d need to re-write the instructions part in your own words for copyright purposes (and Google confusion) and link to my page, so once you do that that’s fine! THANK YOU for asking!! SO glad to hear!! You’re so welcome and thanks for the feedback!! This is delicious.. but how do I bring the heat for next time?? What do you recommend. Thanks! Crushed red pepper flakes: I would start with 1/4 teaspoon in the beginning so that that gets heated up with everything else. Taste and you can always add another 1/4 teaspoon. Harissa paste: if you have a harissa or chili paste, you can stir a little in before the simmer part so that it can heat up with everything. Even sriracha can work. Lastly, and my favourite, scotch bonnet pepper sauce which adds flavours and lots of heat. A few drops right before simmer again, and you can taste and decide whether you want to add more. I hope that helps! Thank you so much! I’m so glad to hear. 🙂 I hope you enjoy!! Amazing. Texture reminds me of a peanut butter curry, which I totally think you should make a recipe for! I didn’t have lime, so I subbed lemon, which was fine, also didn’t have coconut flour, so I used white with no problems. Had everything thing else in my pantry!!! Great recipe! Hi Sariah, I’m so glad to hear you enjoyed my recipe!! 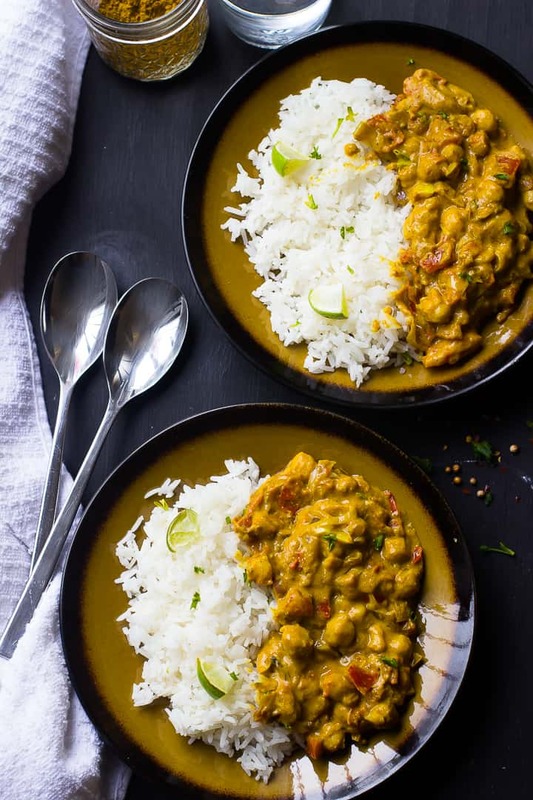 I’ve never thought of peanut butter curry but it sounds YUMMY!! Thanks for your feedback! I’m so glad to hear Lorena! You’re so welcome and thanks for sharing your feedback! I absolutely LOVE this recipe. It has become a staple and I make it once a week! My husband is not vegan so I usually just pan fry a sliced chicken breast and add it on top of his. SO glad to hear that!! Thanks for your feedback! 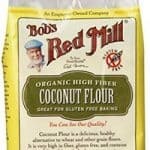 Has anyone tried this with a different gluten-free flour? I have numerous other flours in the house so I don’t want to buy another at this time. Hi Anita, you can try quinoa flour or even gluten free flour if you have it! Just use equal amounts and it should be fine! Im a new vegan, and i hate cooking and not a fan of Indian food. However i wanted to try this and i can say that this might be one of my new favorite meals now. It is so delicious! Thank you! SO glad you enjoyed this Lamees!! Thanks so much for your feedback and you’re very welcome! I tried this curry yesterday and I loved it!!!! Just recently discovered your fantastic blog Jessica, thank you for the wonderful recipes!!!! I’m SO glad you enjoyed!! Thanks so much for your feedback and your kind words!! Thank you so much for this recipe! I made it yesterday and believe me, I didn’t want to share! It was so delicious and a true hit at my house. Haha I’m so glad you enjoyed it Janet!! Trust me, I never want to share mine either. ? Thanks for your feedback! Thank you for this great recipe! It turned out delish! I tweaked it a bit by adding some green chillies for heat as well as some paneer and cilantro. I’m so glad you enjoyed it! Those green chillies sound amazing!! Thanks for your feedback! Has anyone tried freezing this recipe? And reheating? We are trying to meal prep so that we still eat healthy despite how busy we are! Hi Hannah, lots of people have commented that they have frozen and thawed this. I would recommend thawing it on the stovetop to retain the consistency. Mine hasn’t ever lasted long enough to freeze haha but it should work fine for you! Thank you for the delicious recipe. It was creamy and very tasty, everyone loved it. Will be making this again. You’re so very welcome! So glad you enjoyed and thanks for your feedback! Made this today to eat for my lunches for the week. I couldn’t resist a few bites and I have to say, I can’t wait for Monday so I can eat my first lunch of it! It was delicious! Made some quinoa to go along with it and these will make for a wonderfully tasty meal prep week, thank you! I’m so glad to hear that!! Love the way you meal prepped it. You’re so very welcome and thanks for your feedback! I used ground cumin. I hope you enjoy!! Jessica this is delicious! I was fresh out of limes but had lemons and that worked. I also stirred in some baby spinach and amchur powder at the end.the end. If you haven’t tried amchur powder in curry check it out. It’s ground dried green mango. Tart and yummy! I’m so happy to hear that – thanks so much for letting me know!! I haven’t tried that powder before but I definitely need to now! We tried the recipe with my partner yesterday and its taste was beyond words!! Oh I’m so happy to hear that!! You’re so very welcome! Make this tonight and it was so awesomely good!! I added sautéed kale and onions on top of quinoa. Yummy!!! I’ve passed this recipe to friends, encouraging them to try this meal….super easy to put together and makes enough for a few lunches. Thank you for sharing. Hmm, I’m not so sure to be honest I’ve never measured it in cups haha. Maybe ¾ cup? Thank you so much! All my portions are measured by cups…cannot wait to try this recipe this weekend! Beautiful easy, healthy and very tasty?? Will become a favourite!! Thank you for sharing ?? So happy you enjoyed Louise & Tony!! You’re so welcome! Where have you and this recipe been all my life!? YUM!! This is the kind of comfort food that literally lights up your soul! And so easy! Thank you Jessica… My belly will now be completely satisfied throughout the coming winter. This is truly perfection! Made this curry last night, was incredible!! The whole family loved it! So happy to hear Maria! Thanks so much for your feedback! I tried this recipe and apart from being super easy to make it is delicious! Even my husband who is not a fan of vegan food said it was great! Definitely this will be one of my new weekly favorites. Oh I’m so happy to hear that!! Thanks so much for letting me know :)!! Looking forward to trying this! I do have a question. The recipe calls for cumin but I didn’t see you add any in the video. Did you add the cumin? Was it ground? Thanks! I hope you enjoy!! I added ground cumin, seems I forgot to add that scene to the video! Very delicious! The first time I made this I followed the recipe exactly. I found there to be too much sauce, so the nect time I added a diced potato. In my opinion, even better. I’k going to make it again tomorrow with the added potato and I’m going to add about a cup of peas. Hey Randy, so happy to hear that!! Love the diced potato idea, and the peas! Thanks for your feedback!! Hey Phyllis, Oh I’m SO happy to hear that!!! Thanks so much for your feedback! 🙂 Hope you enjoy everything else too! I’m assuming you dice the onion. It does not mention that step in the ingredients or recipe. Also, the ingredients list does not mention the coconut oil. I didn’t realize I needed it until I was in the middle of making the dish and it is mentioned there. It would be helpful to include that in the ingredient list if it is recommended to be coconut oil and not just any oil. Thanks! No, I definitely mean sliced onion, just like what it says in the ingredients and the video! I half and slice mine, not dice. If you want to dice them, go ahead! It doesn’t affect the recipe at all. Also, you don’t need coconut oil specifically. I just always have coconut oil so I automatically wrote that in the instructions. Any oil works. I hope that helps, and I hope you enjoy! This was a delicious lunch for my family of four – with leftovers for tomorrow. I added a cup of frozen peas with the chick peas. I agree, the lime is essential! Thanks for the recipe! Oh yum! Love your additions and so glad to hear you enjoyed! You’re so welcome!! Haha thanks Charles!! I’m so glad you enjoyed! Yes the lime is so essential, right? Cashews sounds amazing to add in too! Thanks so much for your comment!! Do you use 2 yellow onions + a red onion or is it either or? Thanks. Either or. I hope you enjoy!! Just made this for dinner tonight after seeing the video on FB and I am SO happy with it! I have never been a huge curry fan but this is absolutely delicious. The curry flavor isn’t overpowering and everything is creamy and satisfying. Thanks for such an easy recipe! Hey Valentina! So happy to hear this and that you enjoyed so much!! You’re so very welcome!! I love this dish. It i is my “go to”dish and I often take it to potlucks. Today I had withdrawal since I had not made it in a couple of weeks. We went to an Indian restaurant for lunch and I had chickpeas and spinach and came home and made it at home with spinach as I usually do. It was so good. Jessica, thank you so much for this recipe. I am SO happy to hear that!! Thanks so much for sharing with me and here’s to more chickpea curry!! I sliced the onions as you stated in your recipe but when I finished making as you stated I had a pan of sliced onions . Were they suppose to be chopped? I’m a bit confused by your question/comment – a pan of sliced onions? Heyo, I found your recipe looking for something with coconut milk and chickpeas and found this. I liked it a lot. I didn’t have any coconut flour and didn’t want to add wheat flour so I added two cans of chickpeas and crushed some of them to thicken the gravy. Next time, I think I’ll put more garam masala and some ginger at the start. Thanks! So glad you enjoyed the recipe!! Thanks so much for your feedback! Thanks Stella!! I hope you enjoy!! This was the first recipe I tried from you and it was absolutely amazing! I am always looking for vegan recipes that my kids will love and this one was loved by everyone. I only added a very small amount of fresh curry leaves in addition to the spices called for in the recipe, and I used Pastene brand canned “ground peeled” tomatoes. They were “kitchen ready” but unseasoned. I was thinking of trying this same recipe but adding eggplant. Love the flavors thanks! Thanks so much for your feedback!! Love your additions and suggestions. Eggplant would be GREAT too! So glad you enjoyed and you’re so welcome! I added a handful of spinach and a handful of fresh coriander to the sim.er stage. I am wondering, in the ingredients list you call for 2 tbsp of oil to saute. However, I read through the instructions several times and am not finding when, or what to saute. Please help, thanks. So I just switched this recipe to a new format, and I think I added “to sauté” as an error. Don’t mind that, just use it as directed in the instructions. I hope that helps, and that you enjoy!! I have made this recipe three times and will make this curry again and again! My husband and I love it! 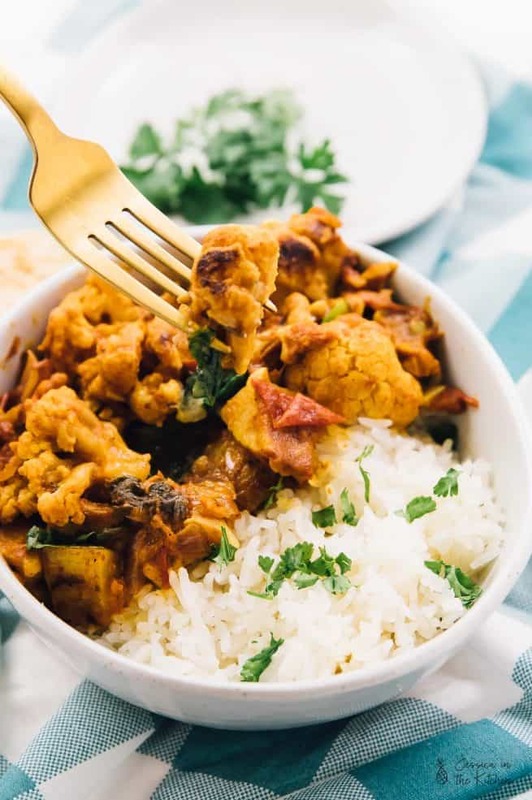 We love going out for indian food, but it is often pricey and too heavy with cream ( for me being lactose intolerant :P) This curry is easy to make, super yummy and a light, healthy dish. Thank you so much for sharing your recipe! Yay! I’m so happy to hear this!! Same with me – I love Indian food but sometimes it is so expensive!! Thanks so much for your feedback and you’re so welcome! I am about to make this for my friend thus week. Can I clarify the onions please? Is it 2 yellow onions and a red onion or one or the other? Don’t want to overdo it! It’s 2 yellow onions OR 1 large red onion. You’re so welcome and I hope you enjoy!! I don’t have a scale and am wondering how many fresh tomatoes you use. Can you please give an idea of how many cups the diced tomatoes are? Thank you! 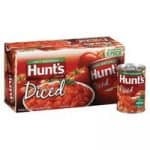 I’m really not sure, but I would say about 1 ½ cups diced tomatoes. I hope that helps! Can you add veggies to this? Yup! Some people above have suggested adding everything from spinach to kale to potatoes – you can add a lot to it! I hope you enjoy!! I never leave reviews online, but I loved this!!! I made as written with only two changes (used stewed tomatoes b/c didn’t have diced or fresh, but tried to cut them up a little), and did a little chicken b/c I’m not vegan. Oh, and I forgot the lime, even though I add it. It was so good!!!!!!!! I am making it again now but going to use meat this time. It is officially a staple in my house. I’m making your vegan curry chickpea recipe my question is can I triple the recipe or do the spice amount change? Aww I’m SO happy to hear that!! So glad you notes helped you so much too haha. You’re so welcome and thanks so much for your feedback!! After a bit of searching on the internet your recipe came up. First thing I look at is the ingredients. I was so happy to see that I had everything needed to make this recipe. Followed the recipe step by step (added slightly more Curry powder and some fresh sliced ginger cause I like my food spicy) and it came out fantastic!! Thank you so much! This is my favorite thing right now. Oh yay I’m so happy to hear you enjoyed!! Love your changes/additions – you’re so welcome!! Absolutely delicious! Thanks for the great recipe! You’re so welcome and so glad you enjoyed!! Thanks for your feedback!! I used tikka masala instead of garam and spiced it up with sambal oelek. My bf also enjoyed 🙂 thanks for posting! I’m SO happy to hear that!! Love your changes/additions and so glad you enjoyed. Thanks so much for your feedback!! This is one of the tastiest curries I have ever had. You are right about the big squeeze of lime on top – tastes like perfection! Thanks for this recipe. Thanks so much for this recipe, I use it almost weekly ever since finding it a few months ago! Super easy for a busy college student. I just make some rice and warm up the leftovers for a delicious, filling meal! I have found that adding a little more flour (3 tbs instead of 2) works better for me. Thanks again!! Cant wait to try more recipes! Very easy to make and very delicious. The family loved it! I just got done making this and I am eating it now! So good! Thank you so much for the list of fall foods! So good, so easy, so quick! I made this and it was soooo good. I live that there wasn’t any extra sugar in it and it was so good with the chickpeas. I am looking forward to trying you lentil dish next. Thank you for sharing this with us!! This is a great tasting and simple VEGAN recipe. My picky teenager loved it! Thank You, Jessica. I made it as was instructed the first time and again it was great!!! The second time, I reduced the amount of onions a bit by 1/3 and of course that is all preference. I also added 2 white potatoes (thickly diced and boiled in salt water) when I added the coconut milk only because I needed to use them before they expired. BUT this recipe is perfect as is and at our dining table we eat it over brown Basmati rice. I’ve always wanted to learn recipes using cumin and curry and the like and now I have a great one thanks to Jess. This is so good! I puréed half of mine. So happy to hear Miranda – love that idea too!! I just made this it was so delicious! You’re right, the lime juice really makes it. I had to sub fresh tomatoes for blended tomatoes as I was cooking for a VERY fussy eater, but it worked wonderfully. So happy to hear you enjoyed!! I’m really glad your substitute still worked!! I just finished making this (with a few small adjustments: swapping the cumin for coriander, using chickpea flour instead of coconut flour, and tossing in some roasted cauliflower). I have eaten half a bowl and couldn’t wait to comment. DELICIOUS, so flavourful and filling! This is going to be a repeat-recipe , absolutely! So happy to hear you enjoyed and that this will be a repeat recipe!! Thanks so much for your feedback!! This is one of my favorite dishes!!! We love it. I cook 1 pound of dried chickpeas and use the amount of liquids in the recipe and I also add a lot of frozen spinach. The spinach adds a nice green color and you have a whole meal in one pot. Looks delicious and I can’t wait to try it! Is the coconut flour for thickening and if so, can I replace it with something else? It’s not something I have on hand. Thanks! It’s for thickening! If you’re not gluten free you can use regular flour. I hope you enjoy! So so easy and very yummy! Only added a little bit of red pepper flakes. Surprisingly very filling as well when paired with price. Might add a little chicken to the mix next but overall wouldn’t change a thing! With the spices used its pretty bland. I used Penzeys Rogan Josh spice in place of the curry and garam masala and it turned out great!! I’m so happy to hear you enjoyed this! By the way it isn’t three onions: it’s 1 red onion or 2 yellow onions (that’s why the slash is there cause they are the same in size!). I’ve updated the recipe to reflect this! Thanks so much for sharing your feedback!! Just made curry for my lunch – absolutely fantastic! I’ve made this twice already and it’s been a success everytime! Yesterday I added carrots and raisins. The raisins add a nice sweet touch. My boyfriend had two servings! I have made this & it was really good. I think I followed the recipe quite well but my sauce turned out rather pale instead of the rich brown in your photo… What could I have done wrong? So glad you enjoyed!! A lot of things could affect that – the tomatoes used, the colour of the curry powder, the colour of your garam massage and even whether you browned the spices or not. My husband and I have both made this dish and his always comes out much darker than even this photo because he slightly browns the spices in the pan before adding the liquids. I hope that helps and I don’t think you did anything wrong at all! I just made this for my family- mmmmmmmmm!!! I used extra spices to make a mild, yet flavorful sweeter curry. If I don’t eat it all up, I’ll put it in the fridge for lunches throughout the week- thanks for this treasure! So happy to hear!! Love the changes you made too. Thanks for letting me know, you’re so welcome!! This recipe was delicious! I like heat so I added 1/2 tsp of red pepper flakes and I added a bag of fresh baby spinach in the last five minutes of cooking. This is my new favorite meal. Can’t wait to make it again. This dish was amazing!! Thank you for this recipe. This recipe is a winner, every. single. time. Not only does it taste good and settle incredibly well in my tummy, but it feels like I cooked something to remind me that I love me, and honestly, who wouldn’t love that?! – Thanks for sharing. Thanks so much for this recipe. Very easy to make, the ingredients are not hard to find and it’s so healthy. It’s a hit each time I make it, and it’s now a weekly staple in our household. Can’t wait to try some of the other recipes on this site! Thanks again. I really like your blog, this recipe is so good . I love it. I really like cickpea so it’s nice to have finally a good recipe to use it .I made it today again. Im thinking about adding some tofu next time . I think with the coco and curry it could be very nice. I made this today and it tastes AMAZING! As a vegan, THANK YOU for sharing this recipe!! I liked this recipe and will make it again. Though I will use a little less garam masala and DEFINITELY less onions. I’m not too sure where you are buying your onions, but red onions are definitely not double the size of yellow onions. I will definitely be using just one yellow onion. I am not a big review person but I must say that I just made this and it was simple ,creamy and so delicious ! I used canned tomatoes and i added a heaping 1/4 tsp of chili pepper and some spinach. It will be a staple in my weekly meal rotation . Thanks for the great recipe! This recipe is fantastic! I made it last night for dinner and it’s so good that I think I’ll make it again this week. It was perfect with a handful of spinach and 1/4 tsp. of salt added at the end. I tired this curry thinking it wouldn’t have a lot of flavour…..but boy was I wrong!! Very tasty and quick, definitely a keeper. Hey, Jessica! I made this recipe tonight and although I loved how it made me feel (light, fresh, easy, etc) I found it lacking some flavor. Any advice for taking the flavor of this recipe up a knotch? I just made and ate this one over brown rice with some pickled tomatoes on the side. Very good! Thank you! Oh wonderful! I’m so happy to hear that! Pickled tomatoes sounds like something I NEED to make!! You’re so welcome and thanks for your feedback!! I have a similar recipe passed onto me by a friend that I love, but I added the tomatoes and lime as per your recipe and it was AMAZING!! Thanks for taking one of my favourites and making it even better! Yay! I’m so happy to hear this!!! You’re so welcome!! This looks amazing. Definitely trying it tomorrow. Would have made it now (3am), but i don’t have a lime and i’m not about to miss out on that extra little bit of greatness. Yes the lime is crucial!! I hope you enjoyed!! This is delicious! A lot of flavor. I added kale and Israeli couscous. Turned out great. Just tried this recipe for the first time, it’s amazing! Normally I he a hard time getting the spice level right in curry dishes but with a bit of extra curry powder and some red pepper flakes it was truly delicious. Just made this- Super YUMMY!! I didn’t have fresh tomatoes so had to use canned, didn’t have the Garam Masala but used a little Thai Curry Paste, added chicken thighs that I had sautéed and seasoned, organic multi-colored carrots, which made this dish even more beautiful, and served with rice and steamed spinach. My family loved it! I will look for Garam Masala and make it again!! So yummy! Love your additions!! Thanks so much for letting me know and you’re so welcome! Made this tonight and it was so good and filling! Even my 14 yr old carnivorous son liked it. BUT I’m so mad…I forgot to add the lime juice. I love lime, too! Going to add it to the leftovers though so I can taste it tomorrow! Thanks for the recipe! Hi, I can’t use curry powered (I’m allergic to chilli and peppers) is there something you’d recommend instead or would you just leave it out? Thanks! I made this last night and we really enjoyed it but it was even better for lunch today as the flavours melded overnight. I added some chilli flakes and spinach. I cooked the onion, garlic and spices before adding the tomato because I was wary of getting a raw onion/garlic flavour. Can you please explain the advantage of doing it how you describe? I used tinned chickpeas and tomatoes as well as garam masala from a jar but you’ve convinced me to try it fresh. My partner has asked me to keep this on our regular menu, but I had planned to anyway. It’s delicious but also very quick and easy to cook. I disagree with one thing you wrote; this would never last 5 days in our fridge (too yummy) 😅. Will have to make a double lot next time. Thanks for sharing the recipe, Jessica. I just came across your recipe on Pinterest and it sounds so tasty. This will be a new dish for me, but I can’t wait to try it this weekend! Your pictures make it look so devine! Thanks for the share Jess! This is my all time favourite curry….l discovered this recipe last winter and it has become a go to. I made this curry this week and it was sooo tasty and easy. I found your recipe on yummly when I was looking for a quick fix for dinner. Super excited to try out more of your recipes! This was absolutely delicious. And all ingredients were on hand (which was key, as we are in the middle of a Noreaster here is Stamford, CT). Thank you! Wondering if you happen to have nutrition info (I realize I could just enter each ingredient, but I’m lazy, LOL). Other recipes and this is my most favorite. So so yummy! Next time I will double the recipe and eat it all week!! I’m so happy to hear that Jennie!!! Thanks for sharing with me! Looks and smells delicious, I added finely chopped broccoli for greens. Just a question, can I freeze this recipe? Made this tonight for dinner, it was delicious! I added a sweet potato, red pepper, and frozen green beans. I doubled the amount of spices (maybe mine are getting old). I also added a little tumeric because my yellow curry didn’t give me that nice yellow color. My husband put hot sauce in his and I didn’t and we both loved it. Yum! I was wondering what kind of brand/type of curry did you use? Hi Morgan We used a Jamaican curry powder called “Island Spice” but most curry powders will work, buying an Indian Style Curry powder is always ideal though. Delicious recipe! My husband and I recently became vegetarian/ loosely vegan, and he gave this dish a 10/10. Thanks! This is great we’re Happy you and your husband enjoyed this!! Hello! I absolutely loved this recipe! My only question is, how many grams or ounces would you say is equivalent to one serving for tracking purposes? Hi Carla! Thank you so much! We’re not sure how many grams/ ounces. It serves 5 so weighing it out and splitting it into 5 would give you that figure.I hope this helps! I just made this for dinner! As in, I’m writing this with an empty bowl in my lap. It was incredible. So flavorful, creamy, and easy. It didn’t take long and I just used canned chickpeas & tomatoes. I will make this again for sure! I was thinking it would be great with some potatoes thrown in, maybe some peppers, or other veggies! I would also like to include some naan bread next time. But, just the curry over rice was great! Hi Lexi! Thanks so much for letting us know how much you enjoyed it! An addition of potatoes and peppers sound magical you will definitely enjoy those! This was absolutely delicious! I filled the recipe exactly and wouldn’t change a thing next time. Very flavourful! Thank you so much Emily!!! We love your comment and we’re glad you enjoyed it! Great recipe. The 9year old gives it 10 fingers up. I followed the recipe and glad I did. Coconut chickpea curry was very good. I have substituted black-eyed peas instead though the last 2 times I made this. Even better. Also made the red lentil curry today for first time. I loved it too. These two recipes are in my regular repertoire now. Thanks. Hi Efrem! We’re so happy that you made not one but two recipes and liked them! Thank you for trying them and thank you for your kind words! This recipe is so easy and good! You totally saved me from going to get fast food today 🙂 yay healthy eating! Haha Noelle! Jessica saves the day once again! Thanks for your kind words and we’re glad you enjoyed our chickpea curry. I tried this recipe and while it was good, I added tomato paste and some sweetener to make a luscious chickpea tikka masala. We are smacking our lips as I type. Thanks! Oh wow thanks so much! We love your additions Maya! Made this tonight, and even my husband, who get s bit cranky since I don’t cook meat anymore, LOVED it! The flavors were deep and I ended up adding beet greens that I had gotten that morning at the farmers market. Will be making again, and again! Thank you for your great recipes. Wow Patricia Thank you so much. As a former meat eating husband I will agree that this is an amazing recipe!! We’re glad you both enjoyed this recipe! Hi Stephanie! While it’s technically possible you wouldn’t get the same creaminess to the dish. I hope this helps! Hi Shanique! Thanks for the kind words! A Jamaican twist sounds incredible! jyl.moncrieff@hotmail.com tried this curry and LOVED it… yumm!!! Hey, is the coconut flour nessacery?! Hi Lily! Its good as a thickener, but the recipe survives without it. I hope this helps. I have definitely made this several times already, as everyone I’ve made it for LOVES it. Fantastic recipe! Awesome Jette! We’re so happy you love it! Thank you so much for the kind post! Hi, Jessica. I’m a lifetime member of Weight Watchers and I thought you’d want to know I calculated the Weight Watchers points for this dish and I come up with 12 points for 4 servings or 10 points for 5 servings of this recipe. Hi Karen, Thanks! Is normal WW points the same as WW Smart Points? In response to your question about Weight Watchers’ points, they have changed them (twice since I started 3 years ago), so it’s possible that the point values for the ingredients in this recipe have changed since the time you calculated them. The ingredients in the recipe that have points are the coconut milk (41 points for the whole can), the coconut oil (7 points), and the coconut flour (1 point). Everything else is zero points, including the chickpeas! I hope this answers your question. The recipe sounds delicious. I love curry, and I’m going to try it. I wonder if reduced fat coconut milk would work with your recipe. Do you know? Using the reduced fat coconut milk would change the points to 6 per serving instead of 12. Thank you and I truly appreciate it! 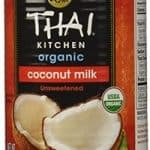 I will update the WW to reflect using reduced fat coconut milk, and will share what it is with regular coconut milk too. To answer your question – yes you can definitely use reduced fat coconut milk! Some readers have even expressed that they used soy milk, or almond milk or boxed coconut milk and it worked fine for them. I truly hope that helps and that you enjoy so much!! I think I’ve made this recipe ten times now. Each time I change it a little bit, I tend to go crazy with the spices and add a bunch more. Sriracha is a necessity to me for the sweet and spicy addition. Such a great recipe to play around with, thank you! I’m so happy to hear this Sage!!! Love the sriracha too – you’re so welcome!! Thanks for your feedback. Love this! Made this curry some time ago and froze half of it for my lunches. My colleagues loved it as much as I did! And you are right: the secret is in the lime! I served with rice and it made a very comforting yet healthy meal. Thank you! Hi Marie, so happy to hear this yay!! Yes to the lime haha. You’re so welcome and thanks for your feedback! Love this curry. So quick and easy. I’ve made it several times but yesterday was the first time I didn’t have fresh tomatoes so I used whole canned tomatoes and I’m really happy with the way it turned out. The tomatoes held together better and I liked the chunks of tomato. This is definitely one of my favourites! I’m so happy that you enjoyed! Thanks so much for sharing with me and about the tomatoes! I have tried making other chickpea curry’s and they were okay. This recipe however is delicious. My husband hates curry and he told me it was really good. Thank you for this recipe! This is a great curry! I use different veg depending on what I have on hand at the time, like eggplant, sweet potato, mushrooms, red peppers etc! I love the variety that you use! Thanks Helen!! FANTASTIC!!! Totally loved this meal! My 7 year old and 4 year old (who is VERY picky) devoured this! My 7 year old would take a bite, close her eyes and hum to herself–she even took seconds. We’re keeping this in our rotation. Thank you so much! Also sooo happy your kids enjoyed this too! Thanks great recipe. Made this last week, really easy and delicious. Flavoursome but not hot. I didn’t add flour but consistency was fine. So happy to hear you enjoyed!! Amazing recipie. Made it for my monthly meal swap with my girlfriends and we all loved it and have made it multiple times sent. Love that it is easy, healthy, and so delicious. Thanks for a great one. I’m so happy to hear that!! You’re so welcome and thanks for your comment! Another AWESOME recipe with great flavor! So happy I found you Jessica! Thank you so much Veda! We’re happy that you’re happy! Oh wow Abigail!!! Thank you so much for your kind words this brought a smile to our faces! We’re happy that you and your family enjoyed this!! So happy to hear that – thank you so much for letting me know!! Made this last night. It took about 40 minutes….but was sooooo well worth it. I even forgot the lime and it was out of this world deeeelicious! Thank you! Thanks for this great recipe, Jessica! Once again, I am late to getting on board with this one, but glad I finally got around to trying it. I used some tomato seconds from the farmers’ market and threw in some baby spinach. It was delicious. 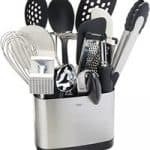 I really love your site and the great recipes. I absolutely love this recipe! I’ve made this for my family, some of whom are vegetarians, and I’ve made it for myself several times to freeze for a quick after work dinner. I add spinach to this recipe which is delicious. I was searching for a recipe for coconut chickpea curry and found your site. I made this tonight and it was so delicious. I made it exactly as your recipe stated. The only thing I needed was some naan bread. I have been looking around at other wonderful recipes here and want to say I will be making many of them. Thank you. Someone posted your recipe on my Facebook page today and I immediately wanted to try it. I love it, and so easy to make. I did add some red pepper flake, because I do like things spicy, and at the very end I added some fresh cilantro which really made it flavorful. This will definitely be a recipe I make over and over. Thank you so much! You’re so welcome Joan and I’m so happy to hear that!! Really great meal, quick to make, so I am sure I will be making it over and over again now! So happy to hear Ewa!! Hi! I tried this receipie for my lunch and I adore it. I’m not vegan or vegetarian but I like to try new thing once in a while. I loved the taste, it’s going to be one of my favourite. Thank you! You’re sure there’s nothing to sub the tomatoes with? I’m allergic to them but am looking hard for a vegan curry recipe. Quite a few readers have just left them out! You could even try a pumpkin puree, or a butternut squash puree, something along those lines. It wouldn’t taste the exact same but would still give it that creamy texture! I hope that helps!! This recipe is to die for, my house smells like heaven right now. Will certainly be making this again, just begun my vegan journey and this recipe really hit the spot so thank you! I made this chickpea curry tonight and loved it! My husband was very impressed. Finally, he wondered if there was meat in it! I added sled cauliflower to it and liked it. Thanks for this easy and great recipe! Love this curry – it’s tasty and oh so easy. Has become a staple in our house. I’m so happy to hear this!! Thanks for sharing with me!! Love this recipe! Serve it to my family at least once a month. I am not vegan but love being able to serve a delicious vegan meal and teach my kids about diversity in food. Wow Alicia that is so inspiring! We’re glad that our food can be enjoyed by all! Thank you for trying our recipes. This recipe is so delicious! I’ve made this so many times, exactly the way it’s described here and everytime my whole family loves it. Thank you so much for your kind Words Tina! We’re so glad you and your family love it! I’ve made this recipe a couple of times and it is delicious! I use reduce fat coconut milk but I feel because of that I have to use more of all the spices but that’s fine with me!I wanted more color so I added turmeric also. I had two bowls last night 🙂 I paired it with some cilantro brown rice. Definitely my go to for when I’m craving curry and need protein. Thank you Fay for trying our recipe! What can I use in place of the coconut oil? I have a friend that can not have any kind of oil or animal product, no dairy either. if I use a little vegetable stock will it ruin the flavor? Hi Victoria. We haven’t tried it without oil before but vegetable stock should be able to be used. Mind you this will change the flavour of the overall dish. In my country I can’t find garam masala, how can I do it from scratch? Sounds delicious, I will definitely make this dish. You mentioned you grind your own spices. Can you include which ones are used in garam masala and quantities please. I am eating a more plant based diet so all the spices make my meals more interesting and delicious, thanks! Made this tonight and it was DELICIOUS!! I added a little tofu and kale. So filling and flavorful! Thanks so much for sharing with me – love your additions! Nice chapka curry! Thank you. Hi What can i sub for coconut flour (anything?) I dont have any on and but want to make this tomorrow as it looks delish!! Also, love your hair cut! You look radiant and happy. Hi Haviva you can sub any gluten free flour that you would like to! I hope this helps. Thank you..of course after i made it i found that i did have coconut flour (opps). guess i need to make it again very soon it was delish!! Thank you so much Beatriz! I love this recipe! It was just what I was looking for! Easy and so delicious! This is great Aileen! We’re glad you like it! I just tried this Curry and love it. Definitely don’t skip the lime. I actually used a drop off lime essential oil because I didn’t have a lime. Hi Jessica, I know this recipe has been up for awhile but I just made this for dinner and LOVED it! I am not vegan but moving slowly in the direction of a plant based lifestyle and I can’t wait to try more of your recipes. I added carrots and spinach ( because I was too lazy to cook separate vegetables) and it was delicious. Thank you! Thanks so much Marcia! We love cauliflower rice too! It does keep well in the fridge or freezer so everything should work out well for you. I can’t wait to make this with the correct tomatoes. The can I had was 16 oz of crushed tomatoes but I added more curry and garam masala to balance it out and am enjoying it very much. Also due to stomach issues, I held off on black pepper. I might try this with paneer, being a vegetarian, also with drained lentils instead of chickpeas for a delightful variation. Super easy to put together! thanks so much! It is definitely a comfort food! yahoo! Hi Victoria we’re glad that you love the recipe! Your variation sounds amazing! Thank you so much for taking the time to leave such kind words. Hi Honey! This is so great! Homemade Garam Masala really is incredible! We’re so glad that you and your family was able to enjoy our recipe! Thanks for your generous review as well! We hope you have a wonderful day! I just made this and it was great!! Took the easy way — everything was canned, spices were bottled, all I did was chop an onion and slice a lime. I will definitely make this again using fresh ingredients and adding other vegetables, but what a great recipe to keep the ingredients in the cupboard to always have a quick healthy meal available! Should have added: I used a can of chopped fire roasted tomatoes and did not drain them. I added one TB of coconut flour, and I think the consistency was perfect. Served with white rice, naan, and some Trader Joe’s frozen samosas. Everyone in the family family was happy! This is great Jacey! Thanks so much for your kind words we’re really happy to hear you and your family love the recipe. Hi Jenni we’re so happy that you enjoyed it! Thank you for reading! Absolutely delicious! Easy to make. Inexpensive and filling. Thank you so much Judy! Thanks for your kind words! Soooo easy to make! First attempt at making this and it was a joy to do! Have yet to serve it – it’s supper on Good Friday for us. Thinking brown basmati rice and some papadums? Toying with the idea of adding chopped fresh spinach. Made it ahead so I will be reheating in Corningware dish so lots of time to add the chopped spinach. This would be great alongside most meat for those who like meat. Thinking this is going to be a new recipe for my month meal rotations!